We are proud to offer equine dentistry and provide care for your horse's entire oral cavity. A horse's teeth and jaw function are vital to their overall well being, so dental care is an important part of your horse's health. We provide floating for horses as well as a range of routine to advanced services. Proper dental care will ensure that the teeth are not causing discomfort, pain, or other potential health issues. • Oral endoscopic examination. 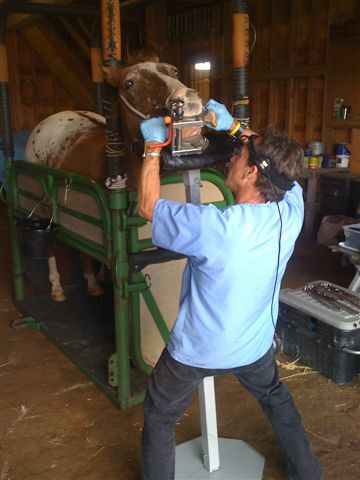 Video endoscopy allows a detailed tooth-by-tooth examination and the horse owner can observe the video in real time. • Digital radiographic examination of the dentition and related sinuses. Dr. Baratt has developed novel radiographic techniques and has published and lectured widely on equine dental radiography. • Routine removal of sharp enamel points and focal overgrowth of cheek teeth. Commonly referred to as "floating teeth." Odontoplasty is conservatively performed for maintaining proper occlusion, prolonging tooth longevity, and providing the performance horse with a comfortable mouth. • Oral and surgical extraction of diseased teeth. Most extractions, even those requiring a surgical approach, can be performed with local anesthesia in the sedated, standing horse. Depending on the circumstances, the extraction may be performed on the farm or in the hospital. When dental disease is not readily identified as the cause of facial swelling or nasal discharge, a computed tomography (CT) scan may be needed for the diagnosis and treatment planning. Recent advances in equine dentistry have improved our ability to perform oral extractions and Minimally Invasive Transbuccal Extractions (MITBE). Dr. Baratt has invested in the purchase of new instrumentation and training necessary for performing these techniques, which permit oral extraction of the cheek tooth without having to use repulsion, which is associated with a significantly higher rate of post-extraction complications. • Coronectomy. This is an procedure that involves removal of some of the crown and reserve crown of the cheek tooth with a right-angled, motorized sectioning bur. By creating additional space, the cheek tooth can be more readily loosened and orally extracted. • Tooth sectioning. The sectioning bur can also be used to divide the cheek tooth into smaller, single-rooted fragment to facilitate oral extraction. This is especially useful when the roots are divergent. • MITBE. In this technique, a small portal is made in the cheek, which allows straight-line access to the cheek tooth (rather than using long right-angled instruments). This technique is particularly useful for cases in which the diseased tooth to be extracted has no crown to grasp with a molar forceps. Instead, a threaded pin is screwed into the tooth and used to pull the tooth into the oral cavity. It precludes the need for repulsion of the tooth, a technique with a high incidence of complications.